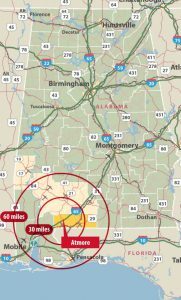 ATMORE, Alabama – Huntsville-based Brown Precision Inc. plans to invest $7 million to open a manufacturing facility in Southwest Alabama’s rapidly expanding aerospace corridor, officials said this morning. Brown Precision’s new facility in Atmore’s Rivercane Industrial Park will create more than 100 jobs, said Mayor Jim Staff, who welcomed the company at a joint meeting of the City Council and the Atmore Industrial Development Board. The family owned company, founded in 1964, performs precision machining for clients in the aerospace and medical industries. It manufactures complex components ranging from aircraft and helicopter components to artificial human joints. Clients include GE Aviation, GKN Aerospace, Bell, PPG Aerospace, and Smith & Nephew. “We think the Atmore area is a great fit for what we do at Brown Precision Inc., and we look forward to being part of the community,” said Dan Brown, the company’s co-CEO and chief operating officer. “We believe southwest Alabama and the Coastal Gateway region is positioned extremely well as a point of growth for the aerospace industry, and we wanted to be on the leading edge of that. Co-CEO and Chief Financial Officer Greg Brown will move to the Atmore area to oversee the new facility. “Brown Precision Inc. is excited to be part of the growing aerospace market in southwest Alabama, and for the partnerships we’ve already formed in the area,” he said. The Atmore facility is expected to eventually employ more than 100 workers in jobs involving activities such as CNC-based manufacturing, custom fabrication and component coating. The company expects to make an initial investment of approximately $7 million in the facility, with expansions possible. Southwest Alabama’s aerospace sector has been on the rise since Airbus decided to place its first U.S. aircraft production center in Mobile. The $600 million factory is now producing A320 Family passenger jets and acting as a magnet for other aerospace and aviation companies. Atmore Mayor Staff called it “an important day” for his community. “Atmore now has more than 200 acres of prime industrial park property along the interstate that will have an access road, utilities, and a community college offering technical training programs literally across the street,” Staff said.